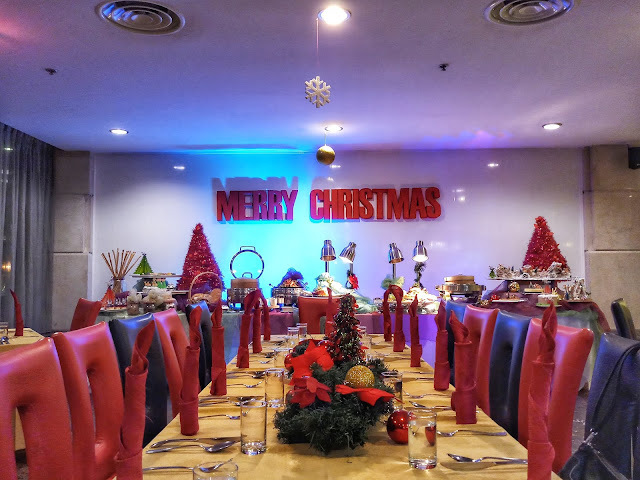 Promenade Hotel Kota Kinabalu had its annual Christmas Thanksgiving with members of print medias and influencers recently to celebrate comradeship. All media fraternities were spoilt with an elaborate buffet dinner complete with a vast selection of signature dishes such as Cranberry Walnut Coleslaw, Oven Baked Turkey with Pineapple, Caramelized Onion & BBQ Sauce, Whole Roast Lacto Chicken with Crudites & Cranberry Sauce, Baked New Zealand Mussels with Grated Cheese and Apple Tarte Tatin – specially prepared by the hotel’s Team of Master Chefs led by Executive Sous Chef – Leonard Lim. To get the Christmas and New Year Festivities up to a good start, Promenade Hotels once again dazzled its hotel guests by decking out its lobby and entrance with a Giant Gingerbread Photo Arch display in the centre of the Hotel Lobby with colourful delights interweaved into the festive menus at its Restaurants & Bar. Mr. Hafizan Wong | General Manager. Promenade Hotel Kota Kinabalu has rolled out a series of festive indulgence throughout the month of December 2018. [Details are as per Promenade Hotel KK’s Festive Calendars of Events attached.]. Get the Christmas and New Year festivities up to good start with families, friends and business associates by spoiling them and yourself with lavish Festive Buffet Spreads, Set Menus & Ala Carte. First in Kota Kinabalu hotels, is Dynasty Halal Chinese Restaurant serving Chef’s Signature Dishes – Braised *Lacto Chicken with Pumpkin Sauce & Deep Fried *Lacto Chicken served with Pickled Ginger Sauce. First Organically Certified Mozart Listening Chicken in Malaysia, Lacto Chicken is fed with Friendly Bacteria (Lactobacillus) and Farmed without Antibiotics & Growth Hormones. The meat contains less fat and cholesterol, and packed with greater flavours too! There’re more in store!!! Have yourself a Merry Little Christmas Guess and Stand a Chance to WIN a 3 Days 2 Nights stay in a Promenade Club Floor Room with Breakfast and Sunset Cocktail at the Promenade Club Lounge at Promenade Hotel Kota Kinabalu by taking a wild guess on the weight of our Gingerbread Photo Arch. For details, check-out ‘Promenade Hotels & Resort’ Facebook Fan Page. [Details as per Flyer attached]. Whether it’s a year-end Christmas or New Year party with your colleagues, friends or an intimate family get-together this Festive Season, by your own party planner with the assistance from our Event Specialist at Promenade Hotel Kota Kinabalu [Tel: (60)(88) 251 415 / 265 555 Ext: 3103].